Parenting children who have RAD (Reactive Attachment Disorder) has been the single most challenging thing of my life. I had read about it, attended seminars about it, talked to other parents who were walking it, but none of that could have prepared me for the reality of it. Because I was not prepared even though I had all the head knowledge, it’s hard to write about this knowing that no matter how carefully I choose my words, they will not be able to fully convey what living this journey is like. I am also carefully structuring my sentences so that they speak in generalities and not about my children in particular. I hope though that in sharing this, others who are parenting kids who have Reactive Attachment Disorder will maybe garner a bit more compassion and understanding from those around them who read this. Children with RAD present very differently outside the home. They are often described as “charming” and “delightful” by others when things in the home are decidedly different. This dichotomy can further isolate parents as they worry that others won’t believe them if they share what the child is like at home. Children with RAD often have poor boundaries and therefore are socially indiscriminate. What you may see as “friendly” and “cute” may actually be a case of mommy (or daddy) shopping. We would appreciate if you would direct our kids back to us if they try to hug you or sit on your lap. We realize that you are trying to help by picking them up or returning their affection, but you may be further damaging their attachment to us. When in doubt, ask us. 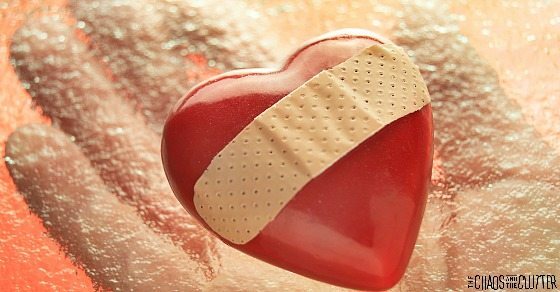 We know in our heads that love will not be enough to fix this, but our hearts often feel differently so we try to pour enough love into our child to replace what is missing. Parents of kids with RAD carry tremendous guilt. It is a heavy burden to carry the weight of something that was done to my child by someone other than me in a time before I even met them. These parents second guess everything. I know that all parents second guess, but when you are parenting kids who have RAD, it borders on compulsive and it is draining. 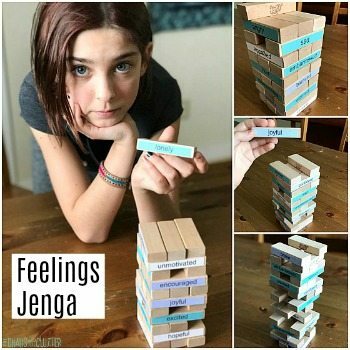 Parents of kids who have RAD sometimes (or often) think they are losing their minds. Kids who have RAD can be expert manipulators, Philadelphia lawyers and extreme triangulators. This can lead to questioning of one’s sanity and second guessing facts that you know to be true. It also puts great strain on marriages or relationships with other caregivers. Parents of kids who have RAD are proficient detectives in their own homes. They need to be in order to keep from going crazy (see #6 above). We are tired every minute of every day. Our child’s hypervigilance can cause us to also become hypervigilant as we attempt to avoid any possible trigger for them. Our child’s emotional needs are often greater than the capacity we have as human beings to meet them. Parents of kids with RAD don’t tell you how bad things are because they don’t trust that you would understand the reasons behind their child’s behaviour and they would rather suffer silently than have you judge them or their child. We don’t tell you the worst because we want to protect our child’s privacy. Whatever we are telling you, imagine it at least ten times worse. Words like “rage” and “aggression” may be codes for “completely out of control for hours” and “physically violent”. We may be sugar coating in an attempt to protect. I would rather have you think that I’m a bad parent than have you think that my child is a monster. We love our child who has RAD. It hurts our hearts to be constantly rejected by them, but we hold on out of hope that healing is possible. We sometimes see a glimmer of the wonderful child that we know is in there and it makes us fight all the harder to love them through this. Perfectly said! I loved every word. You stated this very well. My child has RAD and we’ve been to hell and back. Yes, people have judged me thinking I was doing something wrong. This problem was created by the bio drug addict mom, who was passed out on the couch on drugs while the baby sat in the swing neglected. By ten months the conscience is developed and she did not develope normally. Our child stabbed our dog in the back 7 times with sissors, cut our other dogs eat with sissors. There is so much more, the metal exhaustion is overwhelming. This is more difficult than anyone can understand unless you’ve been through it. My heart and prayers are with you. My 15 year old has RAD, but her psychologist never gave me any tools to use. He had me believing for 7 years she was attached to me. Now every once in awhile she will get angry and say she wants to stab me in the back. Pretty scary. I am learning how to deal with RAD now, but it would have been better if I had learned when she was 2 instead of 15. I still have hope for her. It is really hard for me because she did attach with me until she was 11, now she projects all her anger and hate for her bio mother onto me. I agree, my daughter bonded with me from 5 years old until 12 1/2 ,then rapidly deteriorated into rage, aggression, hatred,revenge,degrading language. .All those feelings of rage and hatred she expressed about the biomother in multiple therapy sessions , with various therqpists thru multiple venues of treatment she now as a teen has displaced onto me at a very intense And constant level of hatred. Like a light switch she switched from loving me and our family to complete alienation. Adoption is Not for the faint of heart. 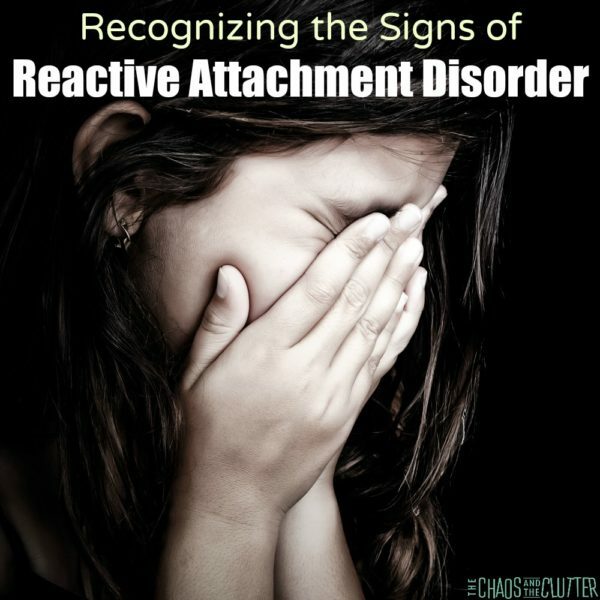 Raising a child with RAD ( Reactive Attachment Disorder), is Not for the faint of heart. Know this, YOU are more than a Conquerer, You are Precious in Gods sight. God gave you a Heavenly assignment with the adopted child He placed in your care that others couldn’t begin to do. Don’t let anybody devalue You for the incredible job You And I are doing raising these unique children. Because YOU are A Good Parent, because You/ I are loving these unique children/teens act out on me And You. Let them try to do our job for even one month And see what they would say them. Thank you for your comment. This has been our experience, too. We hold on to hope for healing, someday, but it is so exhausting and defeating. This comment was what I needed today, the day before Thanksgiving, which was once my favorite holiday. Holidays and RAD are truly a toxic combination. The first thing you said really fit my oldest…so perfect outside the home and horrible here. This is a wonderful post. I also like the part about second guessing yourself. Passive aggressive RAD is alive and well. And ‘lovely’ and ‘a perfect guest’. You wrote so well, Sharla. Thank you for your words. I would add the impact on siblings and the hurt/guilt associated with that. 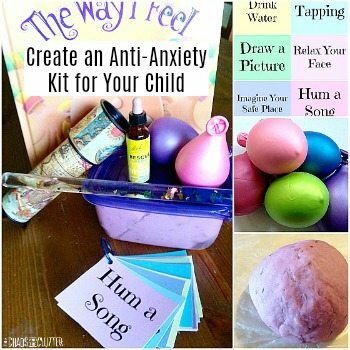 Our son developed severe anxiety after we adopted our daughter due to the stress. He was hoping for a sister and got a competitor and a verbal abuser. That hurts me the most that I was soo exhausted I didn’t get him help. He said he would never adopt and gets mad at how people take the idea of adoption lightly. I completely agree with you Lana. Several of our other kids developed secondary trauma and are in counselling as a result. It has been a very hard road. My husband I desperately need to connect with those that understand. I stumbled upon this blog and I am incredibly thankful, I needed this affirmation. I’m so glad I stumbled upon this post. I’m engaged to a man who has 2 adopted children with a RAD diagnosis. As I think about becoming a stepmom to them, I want to prepare myself as best I can….fully knowing that I will never be prepared. If I may ask, there don’t seem to be many resources in my city for parents with kids with RAD, where do you suggest we find support and how to protect our marriage? Thank you!! I am the stepmom of a RAD child whom we now have custody of. Unfortunately there isn’t many resources. The kids therapist has been our biggest resource… Internet, videos and read read read. You’ll both have to hold stand very strong and support each other above all else. If my relationship wasn’t as steong as it is, I would have ran for the hills already. I don’t say that out of no love for my stepchild, its the fact that raising a RAD child is sooooooo taxing. As a parent, you want to fix what’s wrong but you can’t. Not alone anyway. It takes alot of support, strict structure, strict boundaries and above all else.. Protect your marriage! Don’t do it!! Trust me. Walk away. Especially if you have other children. If it was just me, I wouldn’t have regrets, but my bio children have secondary trauma from step sibling. Especially the stealing and lying and destructiveness. I don’t blame you for your views. I think that adoption agencies do a poor job of informing people about what’s involved when they adopt children who’ve been traumatized. It is extremely difficult to raise children with RAD. Unless someone has gone through this, there is no way for them to understand or even conceptualize what we’re saying. When someone is being loved and cared for, the natural response is for them to be drawn to you and to love you back. Not so, with these children. They seem to reject you even harder, the more you love them. Think very very long and hard before adopting children with trauma. I would like to share some information on RAD and marriage with you. I would just add the toll it takes on the other children in the home. I have tremendous guilt about how much of an impact it has on them. It’s as if you were reading my mind. As someone who used to be a special needs adoption and foster care worker, I wish prospective parents knew, love helps, but………Love is not going to make a kid with RAD “normal”. You are so right! We adopted a child with RAD. This is her 2nd Adoption. They were a good, nurturing family but thought love was enough. I know love is not enough- I have tapped into every resource I can get my hands on. I’m in support groups , I do self- care and we believe she will be healed – to function in this world. But there are days I still say to myself: what the heck did I do . Before I started this journey, I thought “all you need is love.” Boy do I understand how wrong that is AND I cringe whenever someone says it. Beautifully said and so true! Thank you for sharing and putting this into words. I’ve written about adoption and attachment on my website, also hoping to promote understanding, but as you said, ultimately I would rather people think I’m a bad parent than that my child is a bad kid. Plus it’s always that tricky balance of wanting to protect privacy. I wish they understood that my child with RAD was not normal. She looks normal- so they treat her with unrealistic expectations. Don’t try to tell me: well, that’s normal for a pre-teen! I’m sick and tired of having to defend my child- because you can’t accept that she is not normal. Your words ring so true! We have RADs times 3 and it is pure hell at our house often. At least this article affirms my feelings and assures me that I simply doing my best! Our daughter just sabotaged Mother’s Day night by running away… she has been missing from her facility for 28 hours in a state far away from our home and we can do nothing… these ten points hit the nail on the head!! We have a 15 year old daughter who started running away from our home nearly 2 years ago. It´s at the place now that she is basically living on the street with a bunch of delinquents. She´s so “sweet” that we´ve been told many times, it is our fault she´s having problems. We live in Chile, South America most of the time and no one understands RAD. All of the “professionals” think it´s the parents´ fault for being too strict. Thank you! We, as Trauma Mamas, must really stick together. Those that have not walked in our shoes clearly can’t understand what we go through on a daily basis. The ridicule, condemnation and judgment that I have felt and experienced over the years has been damaging. I had to take down my blog for a time and disable comments because of the hate I was hearing. I appreciate your voice and your testimony and pray it helps other Trauma Mamas realize we are not alone. Thank you for writing this, Sharla. I can totally relate to everything you shared. It’s not only what I wish others knew about parenting a child with RAD. It’s what I wish I would have known sooner. Although my children are now grown, I have had to learn to CHOOSE to let go of the bitter and hold on to the sweet. And more recently, I have chosen to stop carrying around the huge burden of guilt that my love and parenting wasn’t enough to heal my child’s pain. I finally made peace with my own pain when I came to the realization that just because things didn’t turn out the way I had envisioned for my family, doesn’t mean I wasn’t called to be my child’s mother. In many ways, parenting a child with RAD made me a better mom and a more creative, compassionate and understanding human being. You are amazing Salina and I am taking inspiration from you. My daughters are almost grown and I am feeling a loss that my time with them was not as close and loving as I dreamed of before adopting them. I was called on/meant to be their mom and have to remember that like you. What I want the world to know is, RAD is real. That these precious children need real help and can heal when given the chance. Thank you for this article. It spoke to me and it helped me see that I am not crazy…my love truly isn’t enough. Hugs to all my RAD moms and dads out there! This is a great open letter. Thank you! I didn’t think my daughters had RAD as they were growing up. I was really ignorant until now. For the past year, my 19 year old daughter, who was adopted at 3 years old, has been telling people very negative things about me and hurtful things I said to her that I never said. This culminated in her aunt taking her from our home to live with her. Our family (my husband and I have one other adopted child) is devastated. We are not talking to the aunt who did this because we are in shock that anyone could step on parents in this way and because our daughter went willingly. Neither the aunt nor my daughter she took seem to know anything about RAD and only blame me and the family. Do you have any advice for us? In addition, my daughter has serious medical issues. Thank you! Thank you for writing this. I am a stepmom to a little girl who has this, and it has been so hard to live through. The only time I find I can have peace is when she is sleeping 🙁 After my step daughter wasted 9 months in therapy(she really had them fooled), we are starting with a new therapist that has had great success with other RAD children. We are hoping for the best because we do not know what to do anymore. Again, that you for making me feel not alone on a journey that seems so darn difficult. I hope you have better luck with this therapist. It is so important that the therapist be someone who is very familiar with kids who have RAD and that they are trauma informed. God bless all of you! I had the honor of partnering with a RAD family for 2 years when I taught their son for first and second grade. I requested to have him in my class again because I loved him and feared him being misunderstood by fellow educators. I have the upmost respect for you all. Thank you for helping educate others through your journey so that we may all have a deeper understanding and be able to support/encourage one another. Praying that God will give you strength and peace in the midst of the storm, for healing for your children, and that caring support people (friends, educators, therapists, etc.) would cross your path. Thank you Aimee. It is always lovely to come across understanding people. I know. I’m praying for you and yours. You aren’t alone. Thank you. Those are beautiful words. I took custody of my Niece when she just turned 4. She is now 15 1/2. When we first got her she would have horrible screaming and punching rages. For years we felt like we were always doing something wrong because other people saw her as a beautiful loving child and all we saw was hate. After years of different counselors we finally found one this year that identified her with RAD. Its been a long road because at first she felt we were taking her to the counselors to punish her. After many many sessions and DBT groups I can say I am finally starting to see a different girl. Even if it is a small change, it is a change. We still have a very long road ahead of us. I’m sorry to hear that it took you so long to get the answers you needed but I’m glad that you are finally on the right road and that some healing is beginning to take place. Thank you. Its nice to see that I am not the only one who has these thoughts and feelings. Its nice to know I am not alone. I can’t thank you enough for this. I was able to share with others so they can understand what we lived so intensely. Sadly I wish the “professionals” we worked with had this knowledge so that we wouldn’t have been blamed for so long (3 years) before our adoption was cancelled. Admittedly, it may have been a blessing, as we couldn’t help the healing journey as we gave it everything we had and love was not enough. No one believed that we were doing everything we could and had been instructed to do, but we could not be the parents we were needed to be. This piece is validating to lift some of the guilt I still feel and the blame. It helps to share and to educate others. Thank you so much. I have an (adopted) grandson with RAD. It’s so discouraging to hear about the trauma families go through. And he and his brother are coming to visit me for 3 weeks soon. Does anyone have any pointers? I have seen the manipulating in person. But I love him and treat him like I do his brother (which I guess is wrong). It is so heartbreaking to look into his little face and know that there is a broken little boy in there. Are there any success stories out there? Has anyone been successful in getting through? Do these poor kids have nothing positive to look forward to as an alternative to prison or stays in psychiatric hospitals? Jacqueline, I believe there is hope. We have seen progress in our two kids who have been diagnosed with RAD. It has been a long and slow road, but we have seen real progress and I believe they have bright futures. I am in tears reading about my journey in your blog. No one, not one person has ever understood our lives with our son. I have now deleted 4 different sentences because of the fear of not being understood again, so the secondary trauma is real. The stories I could share have been closed away deep in my heart because we have no one to trust. Through the years we have learned that even our family and closest friends cannot understand and it’s just easier to bear alone. It has touched me deeply to read there are others like us. 14 years of parenting and at age 18 my son’s RAD is worse than ever. I’ve tried everything to keep the family together but at 18 he moved two blocks away to another family and now on family 3 in less than a month. This article summarized everything I’ve experienced since adopting him from Russia at age 4. His sister does not have RAD. Sending virtual hugs your way Donna. It’s so hard. I would love to hear the success stories out there. It would give me and I’m sure others some hope. I adopted my 14 year old when he was 1 and his 13 year old non-biological brother when he was 2 from Russia. They both have RAD. Over the past several years I have had them in specialized RAD programs, individual therapy, DBT, in-home therapy, and therapeutic mentors. Both are on anxiety/depression medications. I feel my 14 year old is making progress, but my 13 year old is not. What have others done to help? I can relate to much of what you shared. 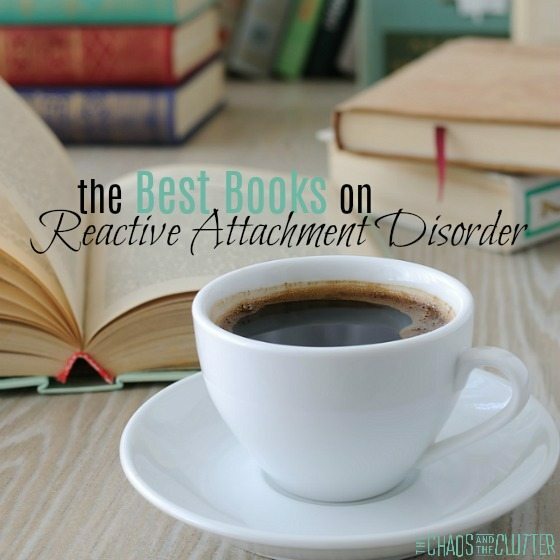 I’ve written a bit more about our recent progress here: https://www.thechaosandtheclutter.com/archives/hope-for-reactive-attachment-disorder Maybe reading it would be helpful for you or give you a bit more hope. Sending virtual hugs your way. This is certainly not an easy journey. We put our 14yo in a rigorous military-style Teen Challenge program for 15 months. It was either that…or he was headed straight toward jail or death. It was really bad. He hasn’t been home that long, so I can’t say whether it’s going to work out in the long run, but so far, so good. Not every boy is a success story in these places, but we now have a light at the end of the tunnel. Had absolutely no hope before. Not sure you’ll see this; it’s been a while since your post. Hope things get better for you. I am a pastor and I’m seeing more parents, not only in the church but the community, struggling with adopted children and RAD. I’m hearing them communicate the isolation, fear, and chaos you expressed in your post. I’m stuck by how little support I am finding in trying to help these families find a safe haven of understanding and rest. Any suggestions? I think educating others about RAD can help parents feel less isolated and less judged. And of course providing practical help is so important. If you can as a church come alongside them and provide things like meals, help with housework or yard work, financial help in some cases (therapies are so expensive), and respite, that would be amazing. I’m so glad to see you asking this question. I wish more churches would get involved in helping parents who are going through this. That’s been something I’ve wrestled with personally. Biblically, we are called to care for orphans, but once we bring them home, there doesn’t seem to be much support. I wish that pastors would preach that adoption is not the only way to answer the call of caring for orphans, that supporting adoptive families practically and financially is a way to answer that call if you yourself cannot adopt. I could have written this myself. Thank you for the reminder that we are not alone. Oh me…I have tears reading all the comments as they are ME! Having a low day today as come often. I have 2 RAD adopted children and 2 bio. The struggles are every day…now in college and have had to move to live with one RAD daughter. We have tried everything…counseling, boot camp programs, alternative school, homeschool, meds. The bottom line is when you really need someone ……there is no one to call! No one that understands. The truth is you can never really solve the main problem. I know God has called us to adopt but has negatively impacted our whole family. I truly dont think i would go through again….and it never really ends. Wow- thank you for sharing this and I’m so thankful that I read this today. Have lived some of this and can echo that other parents/family members do not understand. I have 4 over age 21 bio and 3 little ones recently adopted from foster care, who have lived in our home for 3 years now. 7yo has just been diagnosed with PTSD and RAD. Loved reading your words of wisdom. I agree with every parent and post on this site. 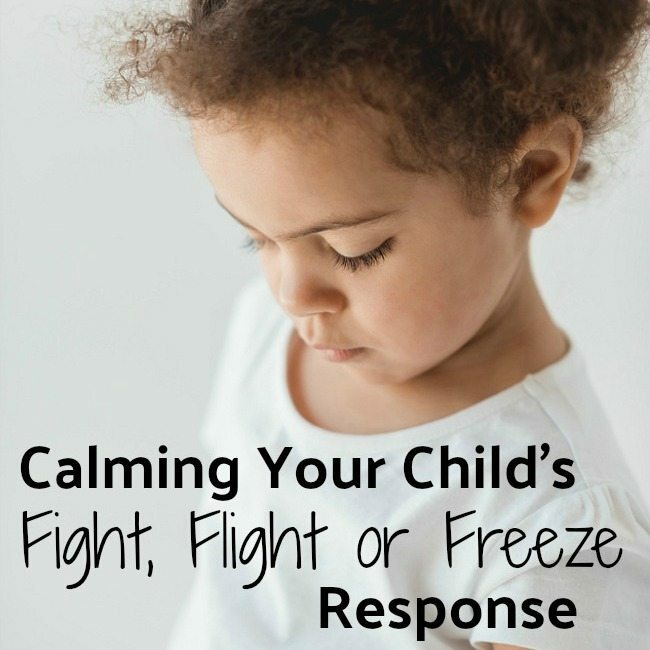 Parenting a child with RAD (Reactive Attachment Disorder) can be challenging and draining emotionally,financially,spiritually exhausting,isolating frightful . More sad is that most psychologists ,psychiatrists, and medical professionals dont really understand the complexities of RAD or treating this disorder. It leaves families, couples,and single parents alone in this sea of deception. We as adoptive parents truly love our children yet have inherted the effects of a severe disorder caused by abuse and neglect of others we do Not know. Well meaning neighbor, or friend, or clergy offering advice or stating ‘just love them more, or use better boundaries, or discipline stronger, or do you listen to your child’. Yes, we listen often 24/7 to cussing,degrading language put downs, threats,manipulation, screaming,throwing things. Words that others do not hear because like a ‘light switch’that child or teen walks out the house or car door flipping off the parent in a rage then like a light switch puts on a big smile And charmingly greets that neighbor,teacher,or therapist with a ‘hello good morning’. I’m learning and I say: ‘ Forgive them for they do Not Know what they do.’ They lack wisdom And knowledge. The entire medical community lacks wisdom and knowledge. The Adoptive parent is often judged. I needed this so bad. My 12 year old son was diagnosed over the summer. His first six months of life with his bio mom was hell. It wasn’t until a therapist in July asked some pertinent questions that we got these answers. He was diagnosed with autism at 7 and the therapies just weren’t helping. Thank you, I no longer feel alone. I am an early childhood educator and I am finishing a degree in early childhood. As my final project, I am researching RAD. 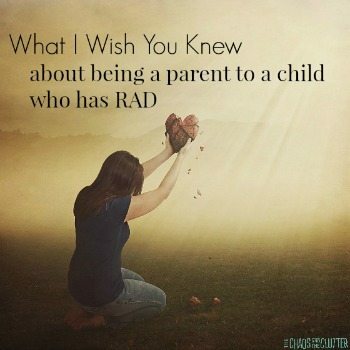 My cousin, has a child with RAD and I had never heard of it until she was diagnosed. Her story is horrific and heartbreaking, as I am seeing in all your comments, she is not alone though. I am so glad that I came across this site and have been able to read the parents side of dealing with RAD. If there is anything you think I should include in my presentation, something you think young educators should know about RAD- I would love to hear from you. Marylin, I am a 15 year-RAD survivor mom of three RAD children. Too many years too late, I discovered the Instituted of Attachment and Child Development in Colorado that really “gets” RAD. The only problem is that education almost needs to come from professionals and not the parents, because family and friends do not really believe us. Worse, when the child becomes independent, they triangulate almost every person close to the mother, and one by one, those family members and friends look at the mom as the bad parent. I have been told that my children reject me because I am a “micromanager”, “overcontrolling”, “dysfunctional”, and have questionable parenting styles, (and this by a sister who has no kids). Lke all these mothers state, it is an utterly exhausting, heart-rendering journey of endless effort. Being a RAD mom has been the most grueling, challenging journey of my life, a journey I could not have handled without Faith and belief that those children are also God’s, and deserve to be loved, no matter how hard it was and continues to be. Our love has to become a mantra of unconditional love, unconditional, unconditional, without expecting any return, or warmth, or loving feelings. A Catholic psychologist and father of 10 adopted kids told me: “Love is not a cushy feeling: real love is doing what is right….and good.” And that is the bottom line, the song you pull up in your heart, day in, day out, when every attempt you make is seen by your child’s distorted lenses as something hostile. Part of the RAd diagnosis is that as they mature, RAd Children will tend to forget all the wonderful memories, and focus solely on their negative feelings. They do project their past trauma and resentments onto their adoptive parents, and as the Institute of Attachment explains, they make their adoptive moms the “nurturing enemy”. Therefore, only people who can help HAVE to be trained RAD specialists. A good RAD therapy will always, always support, support, support the parents. And if we do not give up, but continue loving them the best we can while sustaining clear boundaries, they do grow in tiny increments, a little bit every year that they mature. My oldest RAD 23 year old daughter is now bonding with me and shows me some affection, but that only happened after she lived on her own for six years (and they were VERY rough years!) I know now that their healing from RAD may be a 300 year journey—and I am now at peace with my limitations, accepting that I cannot make them whole the way I once thought my heart could do. All these comments hit home, time and time again. We have survived 3 adoptions from Ukraine—all of them had/have RAD as well as FAS. It is a devastating diagnosis, to both children and family. However, we did discover, albeit too late for our family, a wonderful institute that understands and helps heal RAD. Please, all you beautiful adoptive warrior moms out there, look up: Institute of Attachment and Development, in Colorado. The younger your child, the more they can help. However, moms, while our brains, bodies and hearts are left bereft and devastated, we also know that this is a LONG journey, and 15 years is only a part of it. Have patience with yourselves and….Faith–Faith gives us a bigger perspective about what is good and right—and when these children leave our homes, find your peace and health again. I’ve heard that in some cases, healing occurs, over time. 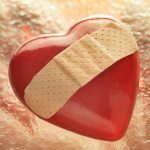 We are beginning to experience some bonding and healing with our oldest daughter, 23–I’m too brain-dead to repeat what she put herself and us through. But with some distance, good boundaries and patience—six years later she is growing in her own way, and beginning to trust and love my husband and me. Every little bit of healing brings so much solace! So, yes, there is hope. Hugs and prayers for healing for all of you!! My 27 year old son married a young lady who was adopted from India at 20 month. It was a long distance relationship (they met online). After they were married I started to see some unusual behavior. Her mother denies any attachment issues when I tried to bring that up via email (even though her moms’ comments in the past have lead me to believe they had more than just “normal” concerns when she was growing up) so they never received any counseling. My daughter-in-law says her mom is unpredictable, insensitive and highly critical. I have seen this myself. I don’t know what to believe – were her parents clueless while she was growing up or was she just so resistant, detached and angry that they couldn’t do much with her? She and my son have now been married for almost 3 years and I’m waiting for my son to realize that many of her problems may stem from early childhood trauma/attachment disorder. He is just seems to try to cover for her and protect her. She has him believing hat her mother doesn’t love her – and from what I can see and hear it is easy to believe. Personally, the more I read, the more I think her mom just didn’t knew hat she was up against and perhaps she didn’t attach to her daughter either. Her mom makes it obvious that she doesn’t trust her to raise the grandchildren (a 1 1/2 yr. old and one on the way). I am also concerned about them, as well as my son and daughter-in-law. How could they find a properly trained therapist if/when they seek help? Like you said it is hard to know what is really true if she is a RAD child, but unless she asks for help, it is better to give them their space to figure things out. Right not, it seems like they are happy, and every marriage (RAD or not) has issues. Poking into her business could jeopardize your relationship with them. Has anyone else dealt with this with their biological child? We cannot, for the life of us understand why, when our child, now 17, grew up in a normal nourishing home and family with us. There was a sexual trauma at the hands of her bio dad at 13 but these issues began at age 8. She has always sought out relationships with other adults and has no appropriate boundaries. To everyone with a RAD child. 1) Your child is not bad, just hurting (“how bad do I have to be before you throw me away too?”). Even if they will do bad things, it is just a defense mechanism because someone else (caregiver, which you are now their caregiver) has hurt them. 3) the inside matches the outside. The child is so disruptive because his inside is filled with turmoil, so the child needs the outside to match as well. Or the child will tell lies about the parent and the therapist will fall for it hook, line, and sinker. 5) I advise Jim Fay’s “Helicopters, drill sergeants, and consultants.” book, contacting Respite Retreat, and Nancy Thomas’s “when love is not enough” and other series. Do not let your child listen to, or read, the material; they will learn how to evade, or be immune to it.